Darjeeling's rare connection with present-day Bangladesh and a part of the hill town's rich history has been reduced to rubble. 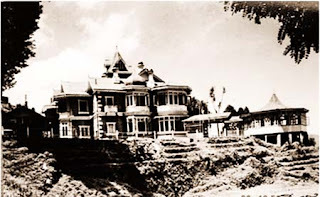 The GTA has pulled down Sailabash, the over-a-century-old summer retreat of the raja of Digapatia, to set up a modern hotel management institute and guesthouse in one of the last few available green spaces in Darjeeling. Digapatia is now in Rajshahi, Bangladesh. The palace under the tourism department of the GTA near Jalapahar and was brought down about two weeks ago. "The building was in a dilapidated state and recent earthquakes too had caused some damage," said Kishore Ghimire, an executive engineer of the GTA. In his book, A Concise History of The Darjeeling District Since 1835, which was published in 1922, E.C. Dozey, a writer and historian, said the building had been set up on land that was once owned by Capt J. Masson, the superintendent of Tukvar tea estate, by the "Digapatia Rajah". The retreat was earlier called Girivilash and the name was changed to Sailabash after Independence. The Late Nayan Subba's soon-to-be-published book, Heritage buildings of Darjeeling, Kalimpong and Kurseong, says Raja Pramatha Nath Rai Bahadur had founded Girivilash whose garden was laid out by a German floriculturist and horticulturist, Morgenstern, and was looked after by 12 gardeners. Nobody could say exactly in which year the building had been constructed. But its believed it was built in the last decade of the 19th century. "Girivilash was a favourite place for the British governors of Bengal....The British army took over the palace in 1942. Later on, it was acquired by the government. It also served as a Tibetan school for a while. The palace has lost the historical grandeur of Girivilash," writes Subba. According to Subba, the colonial building had an attic with miniature gables and a small dome, and an all-weather glazed rotunda with small square windows in classical style. There was a tennis court as well. "Raja Pramadanath Roy occupied the front suite on the ground floor, which included the library, with its precious screens of velvet and ornate wooden pelmets," writes Subba. Subba writes. It was "beautifully furnished with a curtained brass cot and a chandelier. There was a huge grandfather clock, which indicated the days of the month and the full moon day (Ekadashi). On the ground floor were the drawing room, dinning room, tash khana (card room) and the billiards room," Subba adds. Despite being in a dilapidated state, Sailabash was still a landmark in Darjeeling and used to house a guesthouse after Independence. Once the building was taken over by the Darjeeling Gorkha Hill Council, the office of the hill body's vice-chairman was housed there. For the past 20 years, the building had been lying vacant. Bharat Prakash Rai, convener of the Indian National Trust for Art and Cultural Heritage (Darjeeling chapter), said: "How foolish can we be to dismantle such structures in the name of development. Could it not have been repaired? We have lost a piece of history and that is very sad." Dawa Lepcha, the GTA Sabha member in charge of tourism, said: "A big-scale hotel management institution will be coming up and the requirements were such that the building had to come down." GTA executive engineer Ghimire said the project cost had been pegged at Rs 55 crore. "Apart from the institution, there will also be a guesthouse with 24 rooms for in-house training. The infrastructure is being set up as per the parameters laid down by AICTE (All India Council for Technical Education)"
The five-acre plot in which the Sailabash was located has Annapurna and Kafal guesthouses, along with a pond built by the DGHC. "The Annapurna guesthouse will be used as an administrative building for the institution, while a part of Kafal will have to be dismantled. The pond will be smaller in size and we will have facilities for rainwater harvesting," said Ghimire.